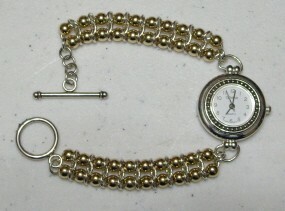 The Calypso Watch is a variation of the Calypso bracelet. The rings are sterling silver with yellow gold filled balls, although you could use sterling silver balls instead. This is an intermediate weave. The watch face and clasp are not included.